I picked up the complimentary ‘Something Extra’ magazine from our local Nob Hill Foods supermarket the other day. 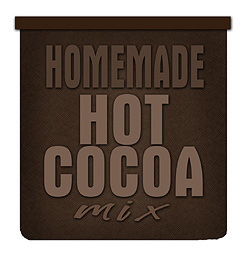 While I was wandering through the pages, my attention caught on the recipe for homemade hot chocolate mix. I was excited because over the last year we’d been looking at the ingredients in all the standard single serving packets of hot chocolate on the market, and it seems that (excluding the more expensive or gourmet brands) there was a lot of unnecessary ingredients in them, including sucralose, which tends to give us both slight headaches. The one with the fewest ingredients was Swiss Miss (sans marshmallows), so we’d been using that. We’re very happy with the way it came out!